On August 17, eager shoppers will hit their favorite thrift stores to celebrate National Thrift Shop Day in search of special treasures and great deals. But there’s more to that thrifted item than a low price tag. Each piece of clothing has an environmental and economic footprint: from the production and manufacturing of the garment to its disposal. This National Thrift Shop Day, let’s celebrate the benefits of shopping thrift, which extend beyond our pocketbooks and positively impact our communities and the environment. Considering that it can take over 700 gallons of water to make a single cotton T-shirt and over 1,800 gallons to produce one pair of jeans, we wear more water than we drink! If these items are thrown in the trash when they go out of style, then the resources that went into producing the garments go with it. 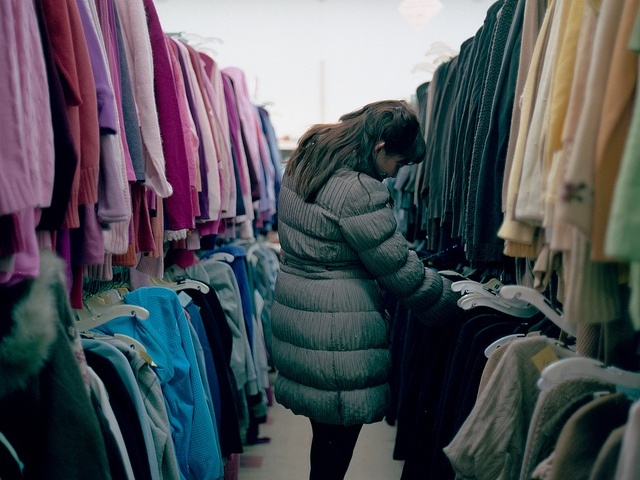 With North Americans now consuming 80 billion pieces of new clothing every year, four times more clothing than in 1980, the environmental impact of clothing has become enormous. From the chemicals to the massive amounts of water used to produce clothing, a single item amasses a large environmental footprint before it ends up in the hands of consumers. Despite the increasing popularity of green lifestyles, people are largely unaware of the environmental and economic impact of throwing unwanted clothing into the trash. By responsibly reselling, recycling and disposing of secondhand goods, the thrift and reuse industry is working to foster awareness around reuse. Shopping thrift and repurposing unwanted goods are easy ways to help conserve resources and give usable items a second, or even third life, through reuse. The clothing industry is quickly becoming one of the most polluting industries in the world, with 26 billion pounds of unwanted goods thrown into landfills in 2015 alone. Unfortunately, 95 percent of the clothing and textiles that end up in landfills could have been reused or recycled. To raise awareness of the impact clothing has on the community and the planet, Savers is challenging everyone to make their next T-shirt purchase a thrifted one. By choosing a thrifted item over something brand-new, we can reduce our clothing footprint and help decrease the demand for 80 billion pieces of new clothing ever year, conserving the precious natural resources that go into making our clothing. Small decisions about what people wear can make a huge difference for the planet when we work together. If one million people choose a thrifted tee in place of a new one, together we can offset 700 million gallons of water – equivalent to over 1,000 Olympic-sized swimming pools. What we decide to do with that T-shirt or pair of jeans when no longer wanted is critical to minimizing our clothing footprint and creating a sustainable fashion culture. When donating items after you clean out your closet rather than throwing them in the garbage, not only are you helping the environment, you’re often benefiting nonprofit organizations in your community. Each Savers thrift store benefits a local nonprofit partner who receives regular payments in exchange for supplying stores with community-donated goods. By purchasing these goods from our nonprofit partners, Savers provides consistent financial support to organizations that provide vital community services to the neighborhoods surrounding our stores. This model fosters longstanding relationships with nonprofits and is a unique approach that engages businesses to build stronger, more sustainable communities. By repurposing, recycling and reselling goods purchased from nonprofit organizations, Savers strives to realize the potential in every item and keep viable goods out of landfills. Savers kept 650 million pounds of goods out of landfills last year alone. Our efforts are part of a dedicated reuse industry that handles over 3.8 billion pounds of textiles annually, working to reuse, repurpose and recycle unwanted goods. When you’re taking advantage of the great deals this National Thrift Shop Day, you’ll be saving more than just money; giving a Sh!rt about your clothing footprint conserves the planet’s finite resources and strengthens local communities by providing funding for nonprofit organizations. Savers challenges you to start with the simple act of making your next tee a thrifted one. Ken Alterman is President and CEO of Savers.